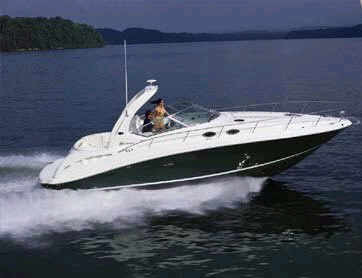 In the 340 Sundancer, high performance, comfort and quality are beautifully combined in one sleek cruising package. Powered by twin MX6.2L MPI MerCruiser® V-drives, the 340 Sundancer is the ticket that will let you discover a whole new world of boating. A roomy, redesigned cockpit offers plenty of opportunity to relax, and her sleeping accommodations for six mean family and friends can go right along with you. The Sundancer 340 has two large double cabins, both with amble space and light. The salon can surfice as berths for two extra, should that be required. The Sundancer 340 has all electonic equipment including GPS, VHS and depthsounder. On deck there's an electronic anchor winch, swimming platform with shower and BBQ. The interior is airconditioned with a fully equipped galley with microwave, fridge/freezer and ice maker. Entertainment systems consist of a radio, tape and CD player with indoor and outdoor speakers and a TV and VCR.